Little Bugger, from Edward Albee’s Who’s Afraid of Virginia Woolf? I kept parakeets for years, beginning with Little Bugger, a green budgie who was my parents’ sixteenth birthday gift to me. Some sixteen year olds clamor for a set wheels. Not me. The film of a fatal car crash shown in Drivers Ed had cooled my engines when it came to driving; it was the head rolling down the highway that did it, A parakeet, I reasoned, would be a much safer bet and, besides, what could be more cheerful than a bright little bird? As a teenager, I needed considerable cheering up. There was A LOT of drama. Mother found me a lovely brass antique bird cage for Little Bugger. Then she found another. Not wanting it to go to waste, she purchased an albino parakeet for herself, whom she named, inexplicably, Rhoda Fang. Rhoda Fang did not last long – like many albinos, she was sickly — but Little Bugger was of heartier stock. He lived for many years, remaining at home when I went north to graduate school, only to expire from hypothermia when my mother set his cage on the passenger seat and drove the five hours from Chapel Hill to Cherokee with the air conditioner blasting. 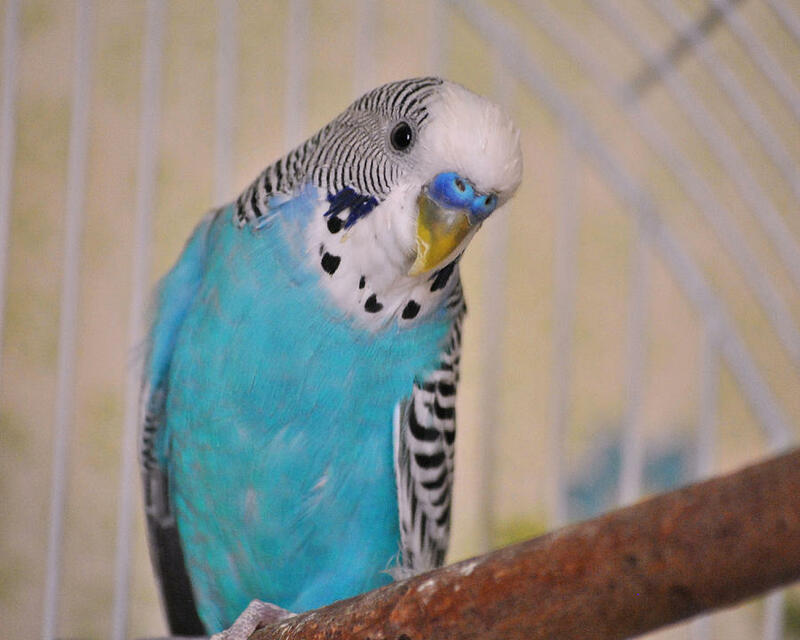 I bought another budgie – blue this time – whom I named after Julian the Apostate, a third century Roman Emperor; later I was accepted at Massey College where birds were not welcome and was forced to consign Julian to the care of another graduate student, who absconded with him to parts unknown. 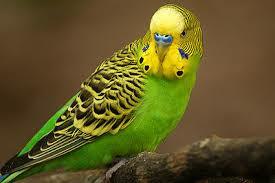 I was not deeply distressed, parakeets being easily replaced and not possessed of much in the way of a personality. 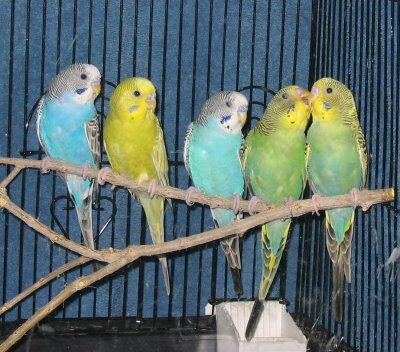 My first husband and I had up to five parakeets at a time – a virtual flock. I say “up to” because one of them was always shuffling off this mortal coil. Many of these parakeets were exotic – yellow and mauve and grey, sky blue and violet. Our flock even included a couple of harlequins and Desdemona, a snowy albino who was far more robust than poor puny Rhoda Fang. We did not confine our little flock to a cage; they flew free and freedom, as it turns out, has its attendant dangers – smacking into a window, for example, or the whole lot of them falling into a pitcher all at once and being unable to extricate themselves, or partaking of rather a lot of lead paint. Unfortunately every time tenants changed in our apartment building, the landlord applied a new layer of paint to the woodwork. Chip, chip, chip away at the top of a door – which, being one of the highest places in the apartment, was a favorite perch – and you hit a layer of lead paint. I spent all of one night watching one of the parakeets die a horrible death from lead poisoning, including violent seizures ending in a piteous paralysis. The next night, when our beautiful Desdemona began to display the same symptoms, I drowned her in the sink to end her suffering. She was the only creature I have ever killed (apart from creepy crawlies) and it was an experience I hope never to repeat. Thereafter the survivors were confined to a cage. When my second husband and I moved in together, I purchased a blue parakeet whom I named Alomar after the Toronto Blue Jays Hall of Famer Roberto Alomar, then at the height of his popularity. My husband likes sports. Using some sort of twisted logic, I figured naming the bird after a sports hero would endear the budgie to him. A few years later Alomar escaped to parts unknown. For years I expected to find a soft little pile of feathers and bones behind some piece of furniture. I never did. He vanished without a trace. To replace him, my children and I went to our local market’s pet store, which always sported a bumper crop of colourful budgies. The kids picked out a blue parakeet, then spotted a rough-looking white one missing some feathers on her head. They clamored for her as well. We named the blue parakeet Blue Boy and the white parakeet Whitey Bit Head. One night, while my son was at football practice and the rest of the family was having dinner, Whitey Bit Head began flinging herself about the cage in what were clearly death throes. That’s when the football coach called to tell us that my son was in the Emergency Room with a possible shoulder injury. I left for the hospital and the girls spent the rest of dinner watching Whitey Bit Head operatically die. Blue Boy did not appear saddened by her demise; he seemed to like having the cage to himself and soldiered on alone for nearly a decade. Then, one morning, I found him lying dead on the floor of his cage in the parakeet version of Corpse Pose — on his back with his little feet up in the air. I don’t think I will get another parakeet. They are cheerful little creatures and quite beautiful, but they poop and fling seed and millet everywhere and I’ve been cleaning up after the Little Buggers for forty six years. Then again, you never know.